The Hindu Rights Action Force (HINDRAF) came out from a series of controversial actions perceived by the Malaysian Indian community as discriminatory. The issues were topical occurrences such as the errant destruction of Hindu temples and the body-snatching cases of Tamil Hindus, thought to have been converted to Islam, as well as the state of poverty confronted by the Tamil Hindu community in Malaysia. From a protest rally in November 2007, led by mainly Malaysian Tamil lawyers, the Malaysian Indian community framed its demands in legal terms and questioned the position of not only the Malaysian Malay-Muslim majoritarian government but also the decolonising decisions of the departing British colonial authorities at the point of Independence in 1957. The 2007 event become known as the HINDRAF rally. It had an overwhelming impact internationally, in drawing attention to the plight of Malaysian Tamil Hindus. Inside Malaysia, by garnering the support of non-Malays, mainly the Chinese, to unite with the Indians, it affected the Malaysian general election in 2008, as the ruling Barisan Nasional government lost its two-thirds majority in Parliament. There was also an unprecedented number of Malaysian Indians who were elected into Parliament in 2008. 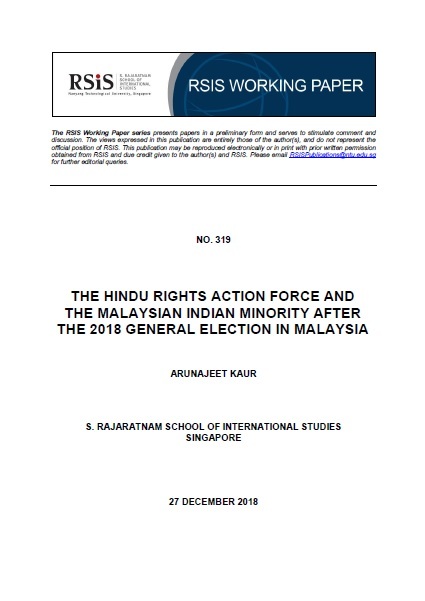 However, this paper will demonstrate that by the subsequent two Malaysian general elections of 2013 and 2018, the Tamil Hindus, as represented by HINDRAF, had not achieved their goals. Enduring heavy-handed treatment by the Malaysian authorities previously and troubled by internal strife and leadership issues within HINDRAF, this movement of Tamil Hindus in Malaysia stands diluted and divided. After the 14th general election of 2018, it seems that the leadership has also accepted a compromised position. Malay-Muslim majoritarianism remains dominant and the “New Malaysia” appears less than that heralded in the early days of the new Pakatan Harapan government.